Ruthie is visiting Nana, who has lots of toys for her to play with: dolls and paints and pretty dress-up clothes. 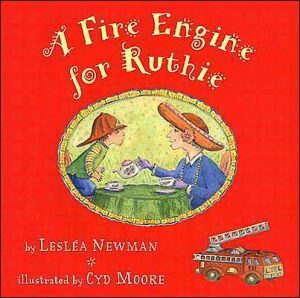 But Ruthie wants to play with fire engines and trains and motorcycles, like Brian who lives up the street. Ruthie uses her imagination to try and make the toys at Nana’s house into the toys she longs for, and shows Nana how much fun it is for girls to play with cars and trucks and buses. A fire engine for Lesléa! On the first day of Ruthie’s visit to her grandmother’s house, Ruthie and Nana walk to the grocery store to buy Ruthie’s favorite foods. On their way home, they pass Brian’s house. Ruthie shields her eyes from the sun to watch Brian playing on his front porch with a fire engine. 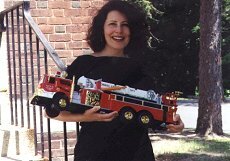 A red fire engine with a black-and-white dog sitting up front and a silver ladder that slides up and down and a yellow hose to unwind and a siren that goes whee-ooh! whee-ooh! whee-ooh! “Do you have a fire engine to play with at your house, Nana?” Ruthie asks. Nana opens an old trunk, takes out her dolls and sits them all around the kitchen table. “Why don’t we have a tea party?” she asks Ruthie. “Okay,” Ruthie says though she doesn’t really like tea parties.